Real books and CDs - E-downloads are cheaper! 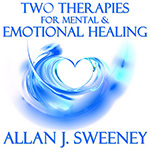 THESE PRODUCTS ARE AVAILABLE AS HARD COPIES direct from Allan J. Sweeney. This manual sold on the internet for over £100 ! You’ll never know how good this book is until you buy it! 504 unique pages of knowledge + 102 exercises! Learn Dr Usui’s unpublished 7 levels, ripple effects, frequencies, attunements, 7-sense biofeedbacks, caveats, byosen, international law etc. Guaranteed to increase your knowledge! Are you a Reiki Master? Buy Manuals at half-price to sell to students - to boost your income and credibility. Students and Masters often say this is the best manual! Una conciencia global se está desarrollando que los ángeles existen, y que algunos humanos son ángeles también - los de verdad, con alas. Este es el primer libro para explorar seriamente cómo puede aprender a ser un ángel. ¿Ha dudado de su trayectoria, se sentía sola o diferentes, quería encontrar o compartir el amor? Aquí están las respuestas de su vida, desde el nacimiento hasta después de la muerte. La experiencia profunda paz interior. Sí, para salvarte pidiendo, Allan ofrece cursos internacionales y conferencias sobre los ángeles. Tanaka is often suggested as Usui’s teacher. This book at last gives substantial evidence, shedding light on Reiki’s true roots, showing real documents and clear historical references, finally ending arguments about the "true" roots Reiki. Tanaka’s healing and spiritual writings pre-date 1910, and were high profile in Japan years before Usui and Reiki. It seems Usui used teachings from Tanaka’s books because some language, spiritual philosophy and lists of treatable conditions – even personal experiences – are identical. Modern Reiki practitioners will learn much new knowledge. 51 illustrations show new cures, psychic methods, and enlightenment that up to now have been lost secrets. This is a true-life WW2 escape story. Edward J Sweeney’s merchant ship was sunk by a German raider, which led to hair-raising escapes from jails in France and Spain. He was re-captured and escaped from a German troop train on the way to a labour camp; a concentration camp in Argeles Sur Mer, France; and from the notorious labour concentration camp at Miranda de Ebro, in Spain where he helped build a major road, carrying large baskets of heavy stones. Described as bigger and better than “The Great Escape”, this human interest story of escapes and survival against the odds touches many hearts. 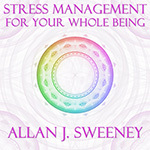 On courses, Allan J Sweeney guaranteed that if the CD did not help someone’s stress – ever – he would give 10 times the money back. No person ever asked for a refund, because this CD works brilliantly! Successfully used by thousands of individuals, therapists, health clinics, and medical professionals. Apart from stress, studies show these types of techniques may help migraine, pain, phobia, eczema, tension, fear, bereavement, asthma, blood pressure, nervous system, anxiety, hypertension and addictions, insomnia and negative emotions such as anger, hate, revenge or sadness. The effects of this CD are improved health, more peace, and increased happiness. Two therapies on one CD - up to 90% of problems are helped or cured while listening to this CD. Therapy A is a gentle method that releases emotional issues such as sadness, anger, hate and bereavement. Therapy B is a powerful method that relieves mental problems such as fear, negativity, phobias. These methods are gentle, powerful, and highly successful. Cures have been obtained by individuals, psychiatrists, therapists, and clinics. Maybe you can be cured in one session too. Lift yourself up with healing sounds! 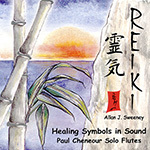 Paul hears energies of Reiki symbols, and plays them on his flutes! One track heals physical; another track helps emotions. 18 tracks for 18 needs. Just lay back and enjoy the comfort this healing CD provides. In ancient times, Egyptian doctors were musicians. Symbols are mathematical energies and Pythagoras said that mathematics is based on harmonic principles. At last we are returning to the healing use of music. CD Reviews. "Keep touching with your music." New Zealand Music Magazine reviewer. BBC TV filmed Allan J Sweeney’ teaching a Reiki class, and brought a self-confessed sceptic, the dour comedian Mike Harding, to sit in and ‘learn’. At the end, the film shows the sceptic has become a Reiki healer. This professionally produced DVD powerfully proves Reiki works - even for sceptics!. Show friends and doctors that Reiki is a real therapy - even for sceptics! Please note: Covers may vary from ones shown.